Teacher of the Bible; junior of Ḥanina b. Ḥama and senior of Jeremiah b. Abba, both of whom he consulted on an exegetical question (Yer. B. B. vii. 15c; comp. Yer. Ta'an. iv. 68a; Eccl. R. vii. 7). He was the innocent cause of great provocation to Judah I., and of consequent neglect of Ḥanina. Judah lectured on Ezek. vii. 16, and misquoted it. 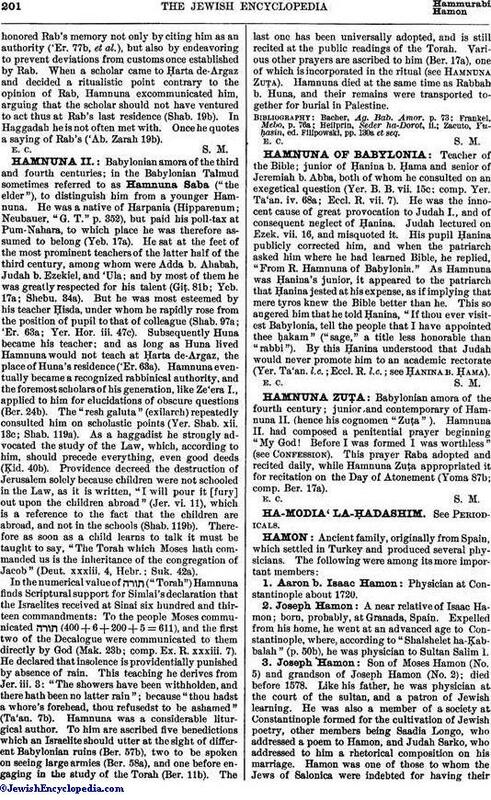 His pupil Ḥanina publicly corrected him, and when the patriarch asked him where he had learned Bible, he replied, "From R. Hamnuna of Babylonia." As Hamnuna was Ḥanina's junior, it appeared to the patriarch that Ḥanina jested at his expense, as if implying that mere tyros knew the Bible better than he. This so angered him that he told Ḥanina, "If thou ever visitest Babylonia, tell the people that I have appointed thee ḥakam" ("sage," a title less honorable than "rabbi"). By this Ḥanina understood that Judah would never promote him to an academic rectorate (Yer. Ta'an. l.c. ; Eccl. R. l.c. ; see Ḥanina b. Ḥama).